The Helmholtz Institute Ulm (HIU) established by Karlsruhe Institute of Technology (KIT) is pushing research relating to batteries of the next and next-but-one generations: A research team has now developed an electrolyte that may be used for the construction of magnesium-sulfur battery cells. With magnesium, higher storage densities could be achieved than with lithium. Moreover, magnesium is abundant in nature, it is non-toxic, and does not degrade in air. The new electrolyte is now presented in the journal Advanced Energy Materials. In many electrical devices, lithium-ion and metal-hydride batteries are applied for energy storage. Scientists are also studying alternatives to these established battery systems in order to enhance the safety, cost efficiency, sustainability, and performance of future devices. It is their objective to replace lithium by other elements. For this purpose, all battery components have to be newly developed and understanding of electrochemical processes is required. Magnesium-based battery cells are presently considered an attractive option to replace lithium in batteries. 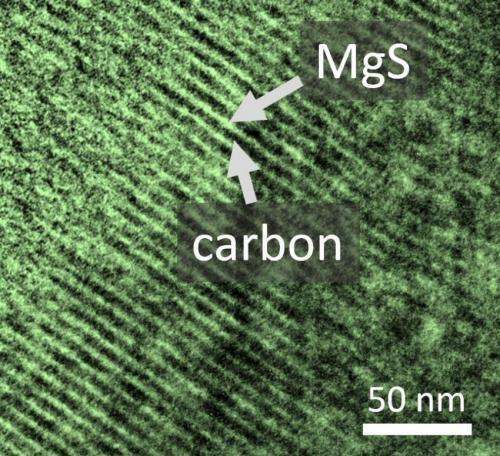 In principle, magnesium allows higher storage densities to be reached than lithium. Other advantages of magnesium are its high abundance in nature, its non-toxicity, and its low degradation in air in contrast to lithium. So far, progress achieved in this area has been limited. For the design of magnesium batteries of high storage capacity and power density, suitable electrolytes are needed that can be easily to produced, that are stable, and can be used in high concentrations in different solvents. At the HIU, a research team headed by Maximilian Fichtner and Zhirong Zhao-Karger has now presented a new promising electrolyte, which might allow for the development of an entirely new generation of batteries. The new electrolyte is characterized by a number of promising properties. It possesses an unprecedented electrochemical stability window and a very high efficiency. In addition, the electrolyte can be used in various solvents and at high concentrations. Moreover, the electrolyte is chemically compatible with a sulfur cathode, which can be discharged at a voltage close to the theoretical value. Another advantage is the very simple production of the electrolyte. "Two commercially available standard chemicals, a magnesium amide and aluminium chloride, are applied. They are added to the solvent desired and subjected to stirring. This simple mixture can then be used directly as an electrolyte in the battery. ", Maximilian Fichtner says. Well, what are the critical numbers? Voltage, density? From the paper preview it seems that the theoretical cell voltage of Mg/S battery is 1.7 Volts which is still considerably lower than the 4-5 Volts attainable with Lithium-ion or Lithium-sulfur, which means that the energy density of the battery is not necessarily that much better in practice. Here is an earlier paper featuring an MgS coin-cell under test. Their old electrolyte quickly destroys the cathode but the cell open voltage should be the same. But it does indicate what a breakthrough this new electrolyte could be. Though it could take a while to get cell longevity and efficiency up to spec for a marketable product. Aluminium has even more electrons per atom, and would have a better energy density too. What we need are batteries that can store several terrajoules to cope with all the intermittent green energy.